Obama speaks about Statue of Liberty, Syrian refugees (VIDEO). 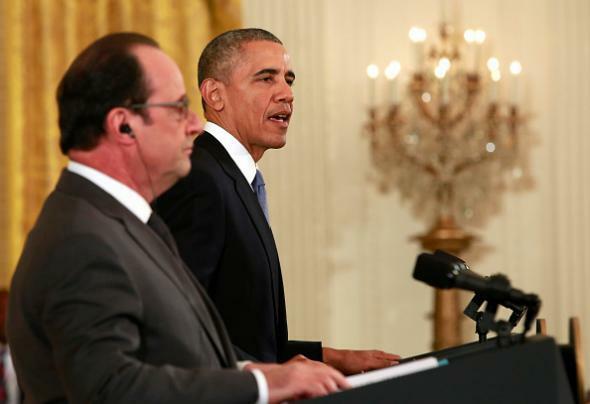 President Obama and French president François Hollande at the White House today. For those who want to harm us, our actions have shown that we have too much resolve and too much character. Americans will not be terrorized. I say all of this because another part of being vigilant, another part of defeating terrorists like ISIL, is upholding the rights and the freedoms that define our two great republics. That includes freedom of religion. That includes equality before the law. There have been times in our history, in moments of fear, when we have failed to uphold our highest ideals, and it has been to our lasting regret. We must uphold our ideals now—each of us, all of us, must show that America is strengthened by people of every faith and every background. Related to this, I want to note that under president Hollande, France plans to welcome an additional 30,000 Syrian refugees over the next two years. Here in the United States, refugees coming to America go through up to two years of intense security checks and biometric screening. Nobody who comes to America goes through more screening than refugees. And we’re prepared to share these tools with France and our European partners. As François said, our humanitarian duty to help desperate refugees, and our duty to our security—those duties go hand in hand. On the Statue of Liberty, a gift from the people of France, there are the words we know so well. “Give us your tired, your poor, your huddled masses yearning to be free.” That’s the spirit that makes us America. That’s the spirit that binds to us France. That’s the spirit that we need today.